The final group is by no means the lesser of the groups and there will be a couple of teams who will have confidence that they can go a good way in this tournament. Latvia as the host nation have decided to play in the middle game and while they could face a tricky match against Belgium, they will be keen to get off to a flying start in this match. With nine players from the 2013 EuroBasket event, the Czech Republic have plenty of experience in this squad. Two of the leading players in the squad are Tomas Satoransky and Jan Vesely. The Estonian squad relies strongly on the players who clinched the qualification spot for the team and head coach Tiit Sokk is the man that the Estonian fans will be pinning their hopes on the squad pulling together. Two people who will definitely be looking up to the coach will be Sten-Timmu Sokk and Tanel Sokk, who are the sons of the coach. The Czech Republic are well placed to get their campaign off to a great start and you will find them with a handicap of -9.0 at odds of 1.90. If you are looking to take advantage of the Over/Under market, go OVER 141.5 at odds of 1.90. Bet Now! Belgium concluded their build-up to the EuroBasket event with a triumph over Iceland. Maxime De Zeeuw offered up 21 points in the win while both Matt Lojesi and Sam Van Rossom both offered up 10 points. Group D hosts Latvia are hoping that a balance of youth and experience will see them progress out of the group stages. 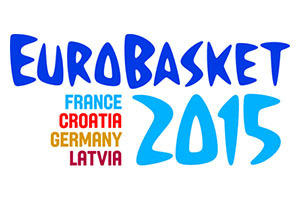 One player who will be massive for Latvia is Janis Blums, who is all set to take part in his 6th EuroBasket event. This could be a close match but taking Latvia with a -4.5 handicap, at odds of 1.90 is a sensible move for the weekend. If you want to go for the Over/Under market, opt to go OVER 141.5. Bet Now! Arturas Gudaitis and Zygimantas Janavicius were the two players who missed out for the Lithuanian team but there will be a lot of hope and expectations in Lithuania. This is a basketball loving nation and there will be big expectations on the team progressing from the group stage and making it to the latter stages of the tournament. Ukraine’s preparation for the event finished off with a loss against Finland. Given that not too many people are tipping Finland for great things this tournament, this may be a big concern for Ukraine but they should be better for this game. The Ukranian side is a young squad with no player older than 28 years old. Kyrylo Fesenko has played for Utah Jazz and the Indiana Pacers in the NBA, which means that he’ll be the player with experience in this team, so his presence will be vital. The Lithuanians are well placed for this game and taking them with a handicap of -14.5, at odds of 1.90, should be of benefit. Going UNDER 148.5 in the Over/Under market makes sense. Bet Now!